Only 5,000 Issued. In Original Frame of Issue. Minted from California Gold Rush gold, that were recovered from the S.S. Central America. Certified Gem Proof by PCGS. No Box or certificate. Contains 2. 41 oz. of pure gold (the equivalent of five "Eagles"). The mintage date for this piece is September 12, 2001. Description: Only 5,000 Issued. In Original Frame of Issue. Minted from California Gold Rush gold, that were recovered from the S.S. Central America. Certified Gem Proof by PCGS. No Box or certificate. Contains 2. 41 oz. of pure gold (the equivalent of five "Eagles"). 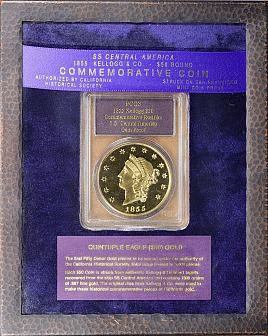 The mintage date for this piece is September 12, 2001.